Photograph showing the baseball team for Massanutten Academy, now Massanutten Military Academy, sometime around 1910. At the far right of the center row is Charles Roller. Donated for scanning by Ron Roller, June 27 2018. 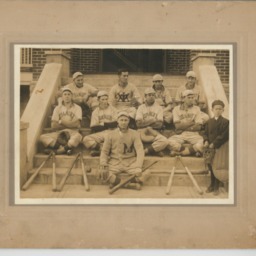 Unknown, “Massanutten Academy Baseball Team,” Shenandoah County Library Archives, accessed April 22, 2019, http://archives.countylib.org/items/show/11698.